Our Festival Centre scheme proposes a building inherently connected with the dynamic context of Sheffield. The building acts as a much needed link to the other world class destinations in the city centre. Continuing the linear form of the existing Showroom building, the Festival Centre marks the beginning of the Cultural Industries Quarter in Sheffield. Acting as a visible beacon, the building itself acts as a window into the creative activities of the city and its inhabitants. 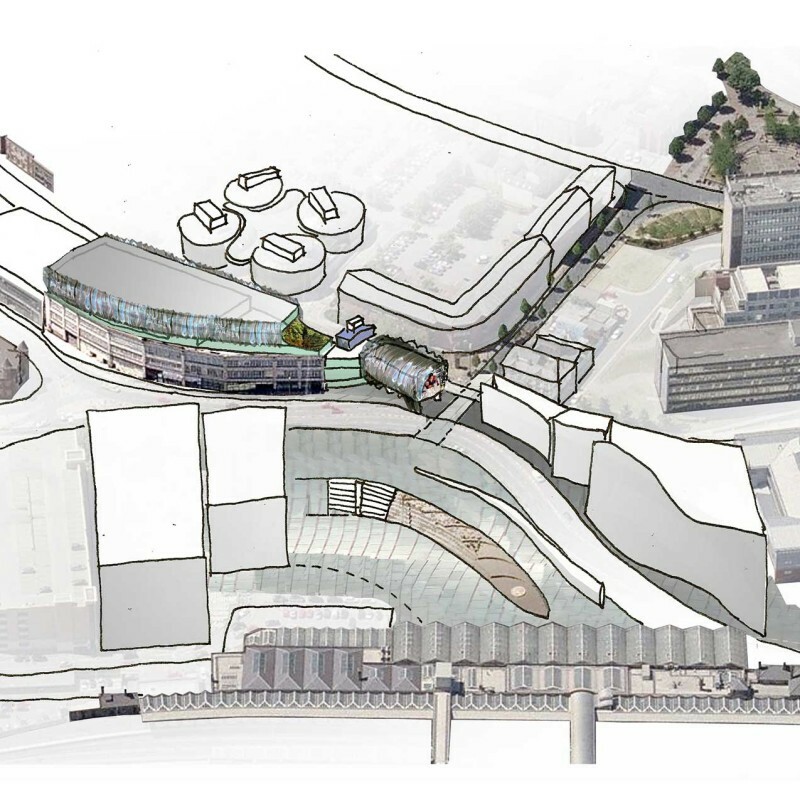 The Festival Centre sits opposite the proposed 1 Sheaf Square development, forming a gateway to the city centre. Pedestrians will follow the route of the metal ‘blade’ through Sheaf Square and towards the Festival Centre. The angle of the end facade balances the new hotel, which creates space for a large video wall to be created, providing a strong visual connection from the station. The wrinkled, concertina wrap is inspired by the bellows camera. It is both a protective cover and a visual expression. The camera analogy provides a contemporary interpretation of an old and somewhat obsolete object, resonating with the ethos of the Festival Centre as a showcase for contemporary and hi-tech creative arts, as well as supporting the traditional, local and specialised areas of film.